The Maryland ACLU dramatically upped the ante on the police spying scandal today, issuing new FOIAs for documents related to 32 advocacy groups and more than 250 individuals. This scandal is about to get a lot bigger, and no one – including the current Governor – is safe. In a conference call with the press (and bloggers) today, ACLU lawyer David Rocah described an “overwhelming response” from fearful activist groups in the aftermath of the state police spying scandal. The ACLU chose to file FOIAs on behalf of groups and individuals involved with large rallies on the theory that the police offered the need to monitor potentially “violent or disruptive” demonstrations as a reason for their prior spying. The groups represented by the ACLU span the ideological spectrum and include ACORN, Amnesty International, Casa de Maryland, Children 1st, Christian Peace Witness for Iraq, Defend Life, Equality Maryland, the Maryland NAACP, Maryland NOW, Maryland NARAL, Peace Action Montgomery, PETA and Progressive Maryland. 1. The ACLU’s FOIAs are not merely directed to the state police. They are also directed to any local police departments holding jurisdiction over the rallies sponsored by the ACLU’s clients. So if a group that demonstrated in Baltimore suspected spying, the Baltimore City Police would receive a FOIA along with the state police. Since the ACLU’s FOIAs cover the period of 2000 to the present, a lot of local officials – including former Baltimore Mayor Martin O’Malley – might have some explaining to do. 2. On the press call, two group leaders directly challenged police units under the control of an O’Malley administration for their surveillance practices. Dr. Tyrone Powers, head of education activist group Children First of Baltimore, alleged that city detectives visited his residence prior to a rally he was planning. His wife and daughter directed the detectives to a hotel where Dr. Powers was giving a speech. At the hotel, the detectives asked Dr. Powers to cancel the rally and told him they had opened an intelligence file on him. Dr. Powers, a former FBI agent, told the city detectives they were wrong to maintain a file on him and held the rally anyway. The rally took place in 2003, during then-Mayor O’Malley’s first term. Jack Ames, leader of anti-abortion group Defend Life, describes his group as “Fighting the Culture of Death.” Ames related a police action against a demonstration by his group in Harford County. According to his account in Defend Life’s newsletter, state police troopers demanded a permit (when none was required), arrested all 18 demonstrators (including 2 juveniles) and held some of them overnight. When one protestor asked, “Why am I being arrested?” the officer responded, “That’s not relevant.” The incident occurred in August 2008. The ACLU is preparing legislation to crack down on police surveillance on lawful demonstrations and other expressions of First Amendment rights. Their Legislative Director said the O’Malley administration had “no reaction” to their proposal. If the new wave of FOIAs upholds Dr. Powers’ and Mr. Ames’ allegations about O’Malley’s law enforcement agencies, the Governor will have to get out in front of this issue or risk offending yet another part of his base. In writing this series, I asked some of the county’s smartest and most connected people two questions. Who are the county’s ten most influential elected officials? And who are the county’s ten most influential non-elected people? Sounds simple, right? Actually, it’s not simple at all. “How are you defining influential?” several of my respondents asked. “That’s up to you,” I replied. And so people went in different directions. One respondent defined influential as “able to get something done, not just perceived self-importance.” Others looked at day-to-day impact on county events. A few went for nationally-known individuals who happened to live in the county. But a lot of respondents identified different people for different reasons, arguing that influence comes in varying forms. Ultimately, my definition of an influential person is someone whom other influential people say is influential. That’s circular thinking to be sure, but it works in this case because the vast majority of our respondents are themselves important players in the county. Elected Official: 18, Government Staff: 8, Non-Profit: 7, Business: 7, Civic: 4, Labor: 4, Civic/Labor 1 (me), Other: 6. Note: Many of the Silver Spring respondents live outside the Beltway. That points to one of the most challenging aspects of this project: the extreme sensitivity of this information. In several instances, bitter enemies voted for each other. In several other instances, public political allies did not vote for each other. That was very revealing: quite a few people are more insecure with regards to their “friends” than their enemies! Of course, many, MANY people voted for themselves. But everyone who answered took a gigantic risk in trusting my pledge of confidentiality and I appreciate that profoundly. In accordance with their wishes, I have deleted all emails related to this project. In Part Three, we will unveil our list of the most influential elected officials in Montgomery County. Voting for the Bailout Bill: Wayne Gilchrest, Chris Van Hollen, Steny Hoyer, Dutch Ruppersberger, John Sarbanes. Voting against the Bailout Bill: Roscoe Bartlett, Elijah Cummings, Donna Edwards. This legislation would have done little to help the hard working people in my district... We must take steps that do not burden the taxpayers such as putting more regulation on the market, restoring a sensible accounting system, valuing these toxic assets with their value today and restraining short sellers who are just trying to make a quick profit. This bill did not do any of those things. This may be the riskiest, most secretive and most sensitive series we have ever run on Maryland Politics Watch. It will no doubt be one of our most hotly-debated works too. Because today, we begin unveiling the results of an exhaustive two-week project designed to determine and rank, at least for the moment, the most influential people in Montgomery County. Other publications have released most-influential lists before, notably PolitickerMD and the Gazette. Like many of you that have seen these lists, I agreed with some choices and disagreed with others. But my primary reservation about them is that they did not make clear their methodology. For all anyone could know, these lists were generated by a handful of editors sitting around a desk. And so I thought: how could this be done better? If any one person generated a list of powerful figures in a local area, that list would be skewed. Every one of us has a station in life. There are some issues we deal with and some we do not. There are some groups of people we talk to regularly and others we hardly know. There are some pieces of our world we perceive (relatively) clearly and others we have never seen. The opinion of any one person or even a small group of people is therefore inherently limited and not up to this task. And so I began to reach out to some of the smartest and most connected people in the county. Who did they think was influential? I started out by contacting several dozen of my best sources. That mushroomed into additional input from their friends and even others beyond them. These people are part of the small network of politicians, staffers, activists and lobbyists that really run Montgomery County. Slowly, secretly – sometimes painfully – they began to tell me the real truth as they saw it. They named who really had the stick and who did not. And soon, soon enough, dear readers – you too will know what they said. In a remarkable post on Red Maryland, the state's most prominent conservative bloggers have come out against the slots referendum. The majority of them are not inherently opposed to gambling, but say that the state's constitution is an inappropriate place to specify the location of casinos. Many of them would favor a straight-up slots bill if passed by the state legislature, a position consistent with those of former Governor Ehrlich and House Republicans. None of Red Maryland's authors argue that slots are inherently immoral, a view shared by many religious people on both sides of the aisle. If Democrats could vote against slots to screw Ehrlich, why can't Republicans vote against it to screw O'Malley? For the most part, the argument of the right is essentially process-related, but many rank-and-file conservatives may prefer slots to a tax increase (assuming they see a trade-off). The right may account for a quarter or more of Maryland's electorate. If grassroots conservatives agree with the views of their leaders, the referendum could be in serious trouble. It's not exactly news that Senator Barack Obama is leading Senator John McCain in Maryland. But his margin is growing so rapidly that it could culminate in a historic blowout. According to Real Clear Politics, there have been three presidential polls in Maryland this summer. On 8/18/08, Rasmussen polled 500 likely voters who gave a 10-point edge (53-43) to Obama. On 8/29/08-9/5/08, Gonzalez Research polled 833 likely voters who gave a 14-point edge (52-38) to Obama. And on 9/20/08, Rasmussen polled 500 likely voters who gave a 23-point edge (60-37) to Obama. Is Obama going to break a record here? And if he does, what does that say about the state of Maryland's GOP? Watching the debate on Friday evening with a crowd of fellow-Obama supporters was a bonding experience for this Democratic voter. Over 50 people crowded into DISH, (a Sandy Spring supper club whose Grand Opening is today) to listen to the Presidential candidates. Conversation was minimal as guests gave the debate undivided attention. Neither candidate appeared to solve the financial crisis by their careful comments, but few in this group seemed to support McCain’s idea of a freeze on government spending. In my opinion, Obama did try to reach out to Main Street more by speaking of the teacher, nurse or firefighter who is struggling. Neither addressed any steps to take to prohibit such a crisis from reoccurring; such reflections would appear to be a requisite first step to forestall future crises. The out of balance compensation for Wall Street executives, who are paid whether or not their companies profit, was a topic I would have liked to have seen explored more. Tax breaks for this group seemed to be an important issue still for McCain. Additionally, on the domestic front, Obama’s health plan description seemed to be presented as the more comprehensive and affordable option for the middle class. Many found McCain disrespectful of Obama as he neither looked nor spoke directly toward him. Perhaps that was some type of a tactic – or maybe it was a strategy, whatever, it did not appear to enhance his performance as a debater. Obama seemed formal, but open, his smiles seemed natural and not forced as did those of McCain, as Barack appeared to reach out more to his audience both in the room and in the national TV audience. That audience has been estimated to exceed 70 million viewers, showing that interest in this election remains high. McCain was definitely the aggressor and attempted to portray his position as one of strength. Certain sound bites were peppered throughout his position answers and at times repeated, even though they did not always appear relevant. To his credit, Obama let few charges pass by without attempting to defuse them. One of Obama’s strong points was his repetitive use of the phrase “you were wrong” when he discussed the Iraq war. In my consideration of this debate, perhaps Obama over used the phrase - “I agree with John” as I thought he needed to contrast his positions forcefully. But the post debate pundits felt that this was a conciliatory tactic designed to reach the undecided independent voters, who prefer consensus to conflict. By attempting to tie Obama to naïve thinking about Ahmadinejad of Iran, McCain was raising fears about the strength of Obama’s commitment to Israel, and his global understanding of the complex issues in the Middle East and nations of near Asia. This repetitive assault on Obama’s supposed lack of experience was skillfully parried in a dignified and intelligent manner belying the insult. It seemed that McCain was also calling out to his base by repeatedly invoking Republican heroes of the past, such as Ronald Reagan and Dwight Eisenhower, although he may have at the same time been distancing himself from the younger voters who are thought to be playing such an important role in the election this year. At the same time, Obama who showed emotion, but not the same passion of his convention oratory, was professorial sharing views looking toward the future. Were there topics not addressed? Certainly I would liked to have heard more about global warming and international accord in that area, as well as how this financial crisis is affecting our international trade and ability to have a strong dollar. What do the two candidates think about international nuclear policies or multi-national efforts in space? We do not yet know and these are among many other topics that were not illuminated by this foreign policy discussion. But 90 minutes is not a very long time to cover topics in depth. We, as voters will have to go to campaign sites to learn more and tune in to the next two debates. Jim Lehrer was a skillful moderator as he attempted to provoke a dialogue rather than allow a stump speech to be revisited. Unfortunately he was unsuccessful in spurring a conversation on the stage. He was flexible and moved nimbly from one topic to the next, pulling the audience along. I was struck that in our group, aside from the partisan cheers and occasional boo, the exchanges held the attention over the food and drink and camaraderie of the gathering. Discussions were left to the post debate reviews. I do not have the same expectations for the Vice-Presidential debate next week as recent interviews have shown Sarah Palin to be out of her depth, once she cannot answer in memorized phrases. Will there be any substantive discussions? I worry that Joe Biden may be too verbose and seem boring or boorish, while she may be perky, if irrelevant, and be considered to have held her own edge if she survives without significant gaffes. In my opinion, she is totally unqualified to be a heart beat away from the Presidency. Sharon Dooley is a Montgomery County Democratic Precinct coordinator. 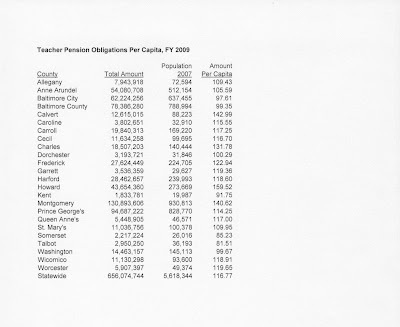 One of the options under consideration in Annapolis for closing the state’s potential billion-dollar budget gap is passing down funding obligations for teacher pensions (currently paid by the state) to the counties. We obtained the following FY 2009 data for the size of those obligations by county from the state’s Department of Legislative Services. In absolute dollar terms, Montgomery is the leader. The state is paying $131 million to fund pension liabilities for Montgomery’s teachers and some of its community college employees. (This is far lower than the $217 million reported by the Gazette in July, but we will trust DLS for our data.) Prince George’s County ranks second ($95 million) and Baltimore County ranks third ($78 million). The average cost statewide is $116.77 per resident to fund pension obligations for teachers, community college employees and some library employees. For Montgomery’s teachers, the cost is $140.62, the highest in the state behind Howard County ($159.52) and Calvert County ($142.99). If the state sent teacher pension obligations down to the counties, these three would be hit disproportionately hard. And for Montgomery, which is already facing a $251 million deficit, the budget impact would be cataclysmic. Why do these counties incur larger pension obligations than others? In the case of Montgomery and, to a lesser extent, Howard, it may be that higher costs of living have led to higher compensation. Another possible explanation is that all three counties are known for excellent schools and perhaps they have found that higher teacher pay is linked to better performance. 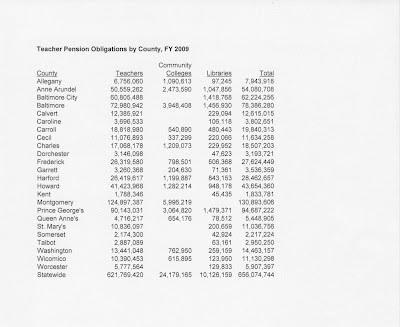 The above data may actually understate the threat to Montgomery County from a transfer of teacher pension obligations. One option that has been considered in the past has been to require counties to partially fund pensions, with “rich” counties paying higher shares than poorer counties. For example, Delegate John P. Donoghue (D-2C) of Washington County introduced a bill during the special session that would have required the counties as a whole to contribute 50% of pension costs subject to a wealth formula. Donoghue’s formula would have required Montgomery to pay 63% of its pension costs while Donoghue’s home county, Washington, would only have had to pay 44% of its costs. Is there any idea that could be more openly opposed to Montgomery’s economic interests than this one? Two other developments occurred this week on this issue. Baltimore County and state officials have talked about various options for sharing the costs, [County Executive spokesman Donald I.] Mohler said. The expense could be shared equally between the county and state. Or the county could begin paying a percentage, or perhaps just the annual increase, which would be $4.6 million a year. “I want to make it clear that at no time has Baltimore County entered into any discussions with the state or any state officials regarding transferring the funding of teacher pensions from the state to local governments. Such a shift of pension costs to Baltimore County would result in a $78 million hit to Baltimore County’s budget that would have draconian budget ramifications for county citizens. Let me make it very clear, and my position has been consistent: the shifting of the state’s responsibility for teacher pension costs from the state to local government is wrong and simply unacceptable. 2. Governor O’Malley told Maryland Moment that he would “rather not” send teacher pensions to the counties. As a former mayor, the Governor has consistently opposed the idea since before the special session. But the Governor is only one player in this process; the Senate and House leaders will have their opinions on the issue too. We recall that the Governor did not suggest the computer tax during the special session but that did not stop the legislature from proposing, passing and ultimately retracting it anyway. We hear that if slots are not approved and out-year deficits project into the hundreds of millions of dollars annually, everything – EVERYTHING – will be on the table. The dust-up between Baltimore County Executive Jim Smith and his spokesman, Donald Mohler, is incredibly revealing. Baltimore Sun reporter Larry Carson quoted Mohler on the record that the county was in discussions with the state over accepting part of the pension liabilities. That no doubt generated some angry phone calls from other County Executives and produced Jim Smith's denial. But is it true? Mohler had no reason to lie to the Sun. In fact, it is entirely possible that Mohler was not told that the discussions were secret. Carson may be onto a much bigger story than he knows. So if some counties are negotiating favorable deals with the state - thereby minimizing their liabilities if teacher pensions are passed down - guess who will be left holding the bag? The prior posts in this series have sought to dispel the notion that Montgomery County is universally rich. This post attacks another misconception – that the county is monolithically white. The twin beliefs that Montgomery County is both wealthy and white make it a convenient target for politicians in other parts of the state. Both beliefs are completely wrong. According to the Census of 2000, Maryland had 5,296,486 residents. Of them, 3.3 million were white non-Hispanic, 1.5 million were black non-Hispanic, 210,000 were Asian non-Hispanic, 104,000 were two or more races and 228,000 were Hispanic (of any race). Foreign-born residents topped half a million. Large percentages of each of the non-white groups lived in Montgomery County. Below we show demographic distributions for the state and its six largest jurisdictions. The column “MoCo Rank” refers to how the county ranks on the number of people in each category when compared to other Maryland counties. Montgomery had 16.5% of the state’s total population but only 15.8% of its white population. Even though its total population was 15.8% larger than Baltimore County’s, Montgomery actually had fewer white residents (519,318 vs. 533,980). Montgomery’s white percentage (59.5%) is lower than the state average (62.1%). Montgomery has fewer black residents than Prince George’s County, Baltimore City and Baltimore County. But its black percentage (14.8%) is still higher than the national average (12.1%). Forty-seven percent of all Asian residents of Maryland live in Montgomery County. Put another way, more Asians live in Montgomery than in Anne Arundel County, Baltimore City, Baltimore County, Howard County and Prince George’s County combined. Forty-four percent of all Hispanic residents of Maryland live in Montgomery County. Montgomery’s Hispanic population is nearly equal to the combined Hispanic population of the next five most-populated jurisdictions. Again, Montgomery leads the state with 29% of all Maryland multi-racial residents. Forty-five percent of all foreign-born residents of Maryland live in Montgomery County, nearly equal to the next five jurisdictions combined. Montgomery leads the state in the number of foreign-born residents from every region of the world. Forty-one percent of all residents that do not speak English at home live in Montgomery County. The percentages of all state residents who do not speak English who live in Montgomery are highest for Chinese speakers (58%), Arabic speakers (42%), Korean speakers (41%) and Spanish speakers (41%). For each of the eight language groups we examined, Montgomery had more residents than any other jurisdiction in Maryland except for African language speakers (where Prince George’s had a slight lead) and Russian speakers (nearly half of whom lived in Baltimore County). Again and again, Montgomery County finished first or second (usually first) in terms of the number of minority residents for almost every group we looked at. The data is irrefutable: Montgomery is the most diverse county in Maryland, and possibly one of the most diverse jurisdictions anywhere in the United States. So dies another myth. And we have killed a number of them recently. In May, we showed how Montgomery County has tremendous income inequality, with the richest neighborhoods enjoying a growing gap with the poorest. In this series, we showed how nominally high incomes in Montgomery are swallowed by high housing and gas prices. We showed one of the consequences of our inability to keep up with the cost of living: foreclosures. And we demonstrated here how Montgomery is far, far more diverse than any other county in Maryland. We are not all white and wealthy. We are multitudes of different cultures and races, many of whom are struggling to get by just like everyone else. And it is time for the Lords of Annapolis to relearn everything they think they know about us. Tonight, Montgomery County's Democratic precinct captains gathered to cast their votes on whether to recommend slots on the party's sample ballot. Their overwhelming recommendation: NO. Montgomery County Democratic Central Committee (MCDCC) member and MPW guest blogger Marc Korman described MCDCC's sample ballot recommendation procedure last week. The Central Committee appointed a ballot issue committee to study four issues: early voting, slots, an anti-tax proposal by Robin Ficker and the transgender referendum (which was decided by Maryland's Court of Appeals). The ballot committee recommended supporting early voting and opposing both slots and the Ficker proposal. Step two was a vote by the Democratic precinct captains, which took place tonight. They voted 112-4 in favor of early voting, 102-2 against Robin Ficker's anti-tax proposal and 97-17 against slots. As of this writing, MCDCC is expected to vote in line with the precinct captains' recommendations, which means all three positions will appear on the party's sample ballot. It is the slots vote that has the most meaning. The Prince George's Democratic Central Committee voted to remain neutral. But an overwhelming majority of Montgomery's precinct captains - a very important part of the party's grassroots base - voted against the wishes of County Executive Ike Leggett to oppose the slots referendum. That adds to the fact noted by the Examiner's Kathleen Miller that voters in the Washington suburbs oppose slots by a 50-42 margin - the only region in the state to lean in that direction. Black churches in Prince George's County and MCDCC's sample ballot will now argue against slots in the state's most-heavily Democratic area. Will that be enough to stop the referendum? And will all of this be enough to cause a rift between Montgomery's County Executive and his party faithful? Montgomery County Executive Ike Leggett will be on the 'Political Pulse' TV Show on Thursday, September 25th at 9 p.m. and Tuesday, September 30th at 9:30 p.m. Topics that will be discussed include Mr. Leggett's decision to support the Slots Referendum on the November 4th, 2008 Ballot, the projected County and State budget deficits, transportation and other issues. “Blue-ribbon commissions,” usually bipartisan groups studying a specific problem outside of the normal legislative system, have taken on mythic status in government. Although they have existed at least since the Roberts Commission that investigated Pearl Harbor, their reputation and demand has soared in more recent decades. The premiere examples are the Greenspan Commission on Social Security Reform and the 9/11 Commission. Undeniably, these commissions can have value in coming up with bipartisan solutions that focus the public, the press, and politicians. But the appointment of a commission can also be a crutch for inaction. The reports these commissions issue usually just gather dust and do nothing to fight chronic inaction on intractable issues. Remember the President’s Advisory Panel on Federal Tax Reform? How about the National Surface Transportation Policy and Revenue Study Commission? The National War Powers Commission? Maryland is not immune to the trend of over reliance on these commissions. A prominent example is the Thornton Commission on education reform. Task forces are common in the General Assembly as a starting off point for legislative reforms. Now, Comptroller Peter Franchot has hopped on the bandwagon and called for a “blue-ribbon panel” to determine where the state can cut spending. But isn’t that exactly what our state legislators and other elected officials should be doing? Since that is the Comptroller’s responsibility, perhaps he could start making a few recommendations instead of calling for another panel or commission. 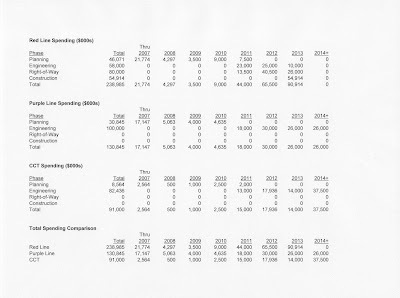 If the Comptroller needs some commission provided suggestions, he can take a look at the Commission on Maryland’s Fiscal Structure from 2002 for ideas. But the last thing the situation needs is a new bipartisan panel to kick the can further down the road. Have you ever heard of zone pricing for gasoline? Under this practice, energy companies, wholesalers and service stations adjust gas prices for shipping costs and a large variety of geographic characteristics, one of which is rumored to be household income for the areas around the stations. This conforms to the basic realities that most of us have noticed in looking for gas. No one drives into wealthy neighborhoods to fill up – we go into relatively poorer areas instead. And so we launched an empirical investigation: do Montgomery County residents pay more for gas than other Marylanders because their household incomes are greater? 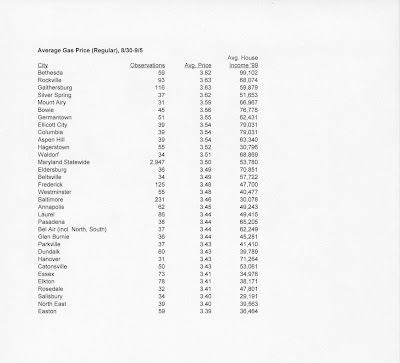 Garrett County had the highest average price, but Gas Buddy’s volunteers only made 26 observations there over the week – less than four per day. Given the small sample size, it is doubtful that that accurately reflects gas prices there. 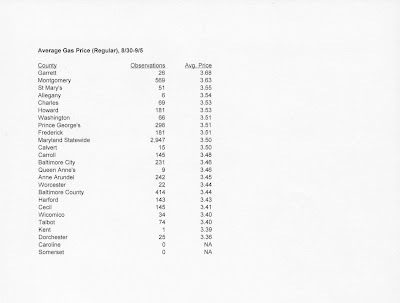 Montgomery’s average price ($3.63) was easily the highest among the remaining counties and was significantly higher than the state average ($3.50). The four most expensive areas for gas were all in Montgomery County, as were six of the top ten. Was that because the Montgomery areas had higher incomes than other places around the state? Not necessarily. For example, Silver Spring’s average household income ($51,653) was slightly lower than in Catonsville ($53,061). Yet, gas prices were much higher in Silver Spring ($3.62) than in Catonsville ($3.43). Similar inconsistencies show that average household income and gas price do not track each other very well. In fact, when we ran a simple regression of household income on gas price, our model found that income only explained 27% of the variation in price. In contrast, a simple regression relating location to price found that whether or not a station was located in Montgomery County explained 37% of the variation in price. In other words, for this rather large sample of price data, whether or not a station was located in Montgomery may actually be a more important determinant of its price than the average household income in the surrounding area. In wealthy local areas (like Bethesda) and in less-wealthy areas (like Silver Spring and Aspen Hill), gas in Montgomery costs more than in the rest of the state. What is driving this? We don’t have enough data to know (so you statistical geeks out there should forget any multi-variate or logit models). One possible cause may be the higher price of real estate in Montgomery than in other counties. Higher land costs, higher mortgages and higher property taxes may be pushing up gas prices here. But regardless of the reason, the evidence is clear: Montgomery County residents pay more for gas than other Marylanders. Metro offers no relief because it periodically raises fares and parking charges. And higher gas prices, like higher real estate prices, may very well ripple through and push up prices for goods and services throughout the county’s economy. So if Montgomery County residents make more money only to pay higher prices for housing, gas and everything else, is their living standard really superior to most people in other counties? Except for the wealthiest residents of Montgomery’s richest neighborhoods, the answer may very well be no. Tomorrow, we will conclude this discussion by taking a hard look at who exactly is paying these high costs of living. Because people in Montgomery County are wealthy, they can easily afford big mansions, right? WRONG. The residential real estate boom started in Montgomery County in the late 1990s, as it did in many other parts of the country. According to Zillow.com, the average market value of a home in Montgomery soared from under $200,000 in 1999 to just over $500,000 in late 2006. The county’s Department of Finance estimates that the average residential sales price topped out at $601,995 in July 2007 before falling to $506,151 in May 2008. These are high prices and steep declines, even for “rich” people to bear. Montgomery County has long been an attractive place to live, but has had problems generating affordable housing. We have previously explored the inadequacies of the county’s Moderately-Priced Dwelling Unit (MPDU) program and the unfortunate tendency of its subsidized housing programs to funnel poor people away from transit. But easy money from sham loan programs convinced many people that high housing prices were no barrier to home ownership in Montgomery County. The inevitable result: massive foreclosures. 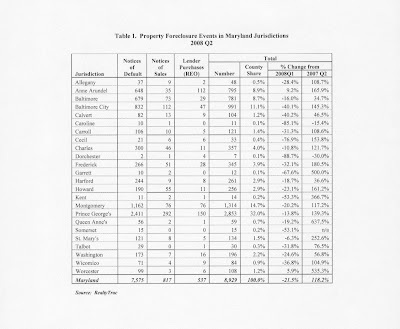 The Maryland Department of Housing and Community Development’s property foreclosure report for 2008’s second quarter listed foreclosures by county. Montgomery County’s total of 1,314 ranked behind only Prince George’s County (2,853). Montgomery’s total was almost as high as the combined total of Anne Arundel and Baltimore Counties. 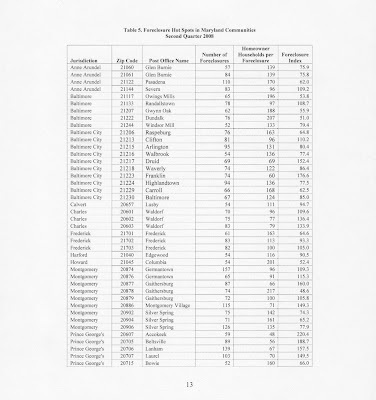 Below is a complete list of foreclosures by county from the report. Montgomery also had two of the top ten foreclosure “hot spots” ranked by total number of foreclosures and foreclosure rates: zip codes 20874 in Germantown and 20877 in Gaithersburg. 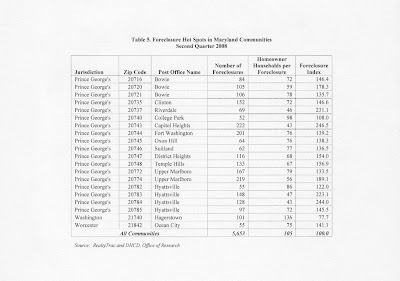 Below is a complete list of zip codes in Maryland that recorded at least 50 foreclosures in the second quarter. The second quarter report credits recent state laws lengthening the foreclosure process with reducing foreclosures by 22% since the first quarter of 2008. That effect has been especially strong in Baltimore City, where foreclosures dropped from 1,654 in the first quarter to 832 in the second quarter (down 40%). Montgomery’s foreclosures decreased from 1,646 to 1,314, a more modest drop of 20%. Clearly this county’s foreclosure problem is far from over. The foreclosure data reinforces a fundamental truth we revealed in Part One: high incomes in nominal dollar terms do not compensate for higher costs faced by Montgomery County residents. In the housing market, that fact contributed to economic pain unsurpassed by the vast majority of the “poorer” counties in Maryland. This is not evidence of wealth – it is evidence of overburdened Montgomery home budgets that is ignored by politicians from elsewhere in the state. But it does not end here. Tomorrow we examine gas prices. Is Franchot Out-Hustling O’Malley for the Black Vote? One of the most-practiced parlor games in Annapolis is placing bets on whether Comptroller Peter Franchot will dare to challenge Governor Martin O’Malley in 2010. If the Comptroller does take the plunge, he may take a lot of black voters with him. One of the biggest battles in the last general session concerned a proposal by the Governor to collect DNA samples from criminal suspects. The Legislative Black Caucus and civil libertarians protested the idea, claiming that black defendants would be disproportionately targeted. So the Governor struck a deal with them: the bill would be amended to provide for DNA collection only upon indictment, and samples would be expunged if defendants were found not guilty. Who is “them,” Mr. Comptroller? The Democratic Party? Its leadership? Or maybe, just maybe... its sitting Governor? It may be true that there are needs across the state. But the conventional wisdom that Montgomery County is universally wealthy is DEAD WRONG. In this series, you will find out that we are not as rich as you think. It is true that Montgomery County has a high median household income in nominal terms. 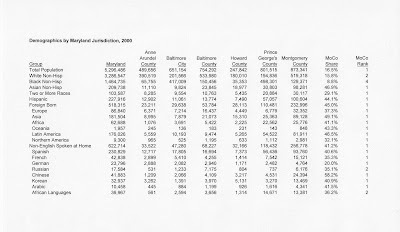 The Census Bureau’s American Community Survey estimates a variety of economic data for 16 of Maryland’s 24 counties (including Baltimore City) for 2006. (Caroline, Dorchester, Garrett, Kent, Queen Anne’s, Somerset, Talbot and Worcester Counties had 2000 populations of under 50,000 and their small size probably prevented reliable mid-term estimates). Of those 16 counties, Montgomery’s median household income ($87,624) was higher in 2006 than any other county except Howard ($94,260). In fact, Montgomery’s household income was 35% higher than the state’s. This would seem to support the view that we are rich. But the factor people miss when they look at household incomes alone is that Maryland’s counties have wildly varying costs of living. This is particularly true of Montgomery, a jurisdiction in which many people work but cannot afford to live. One of the biggest determinants of the cost of living is the cost of housing. 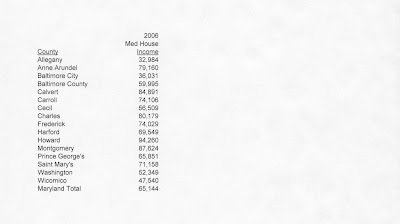 Below are the median home values for each of the 16 counties tracked by Census in 2006. Montgomery’s median home value ($527,700) is 58% higher than the state average ($334,700). For those who have lived in Montgomery a long time and no longer have mortgages, high home values can be a substantial addition to wealth. (Set aside the higher property taxes they create.) But for those with mortgages, higher home values mean higher servicing costs. 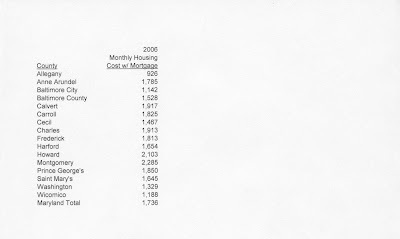 Below are median monthly housing costs, including mortgage payments, for the 16 counties tracked by Census in 2006. Montgomery is the leader ($2,285 per month), followed by Howard ($2,103). So Montgomery has higher household incomes, higher home values and higher housing costs than the rest of the state (with Howard as a partial exception). How do those components balance? 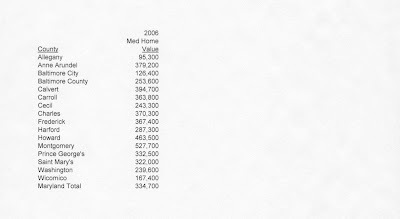 In the chart below, we calculate median monthly housing costs as a percentage of median household income by county in 2006. The data above shows that 31% of median pre-tax household income goes to pay for housing in Montgomery County. Only Baltimore City (38%), Prince George’s (34%) and Allegany (34%) rank higher. The other 12 counties tracked by Census all rank lower with Howard – the richest county in nominal terms – at the bottom. This data illustrates what every resident of Montgomery County knows and is not commonly appreciated in other parts of the state: a dollar does not go far here. Montgomery’s proximity to the nation’s capital combined with its quality schools and modest crime pushes up the price of its real estate, and through it, nearly everything else. Yes, people here have higher incomes in nominal terms, but many here need those incomes to maintain middle-class living standards. For a lot of people in the county, this is not real wealth – it is the illusion of wealth, but one that is believed by politicians from elsewhere in the state. Tomorrow we will begin to explore the consequences of that illusion. What is the Iraq war costing you? What can local government do? What is the Montgomery County Peace Resolution? These questions will be discussed at a Town Hall Meeting on Sept. 22 entitled "Can Montgomery County Help End the War?" County Executive Isiah Leggett will moderate, and speakers will include Columbia University economist Dr. Brendan O'Flaherty and Institute for Policy Studies Fellow Karen Dolan. Cosponsors of the forum include County Council members Valerie Ervin, Nancy Floreen, George Leventhal, Duchy Trachtenberg, and Marc Elrich. In addition to the huge loss of life and the enormous toll of injuries, the Iraq war is one of the costliest in our nation's history in economic terms. These costs are being felt at the local level, and they need to be understood for what they are. Everyone is invited to this Town Hall Meeting, which will be held Monday, Sept. 22, 7-9 p.m., Germantown campus of Montgomery College, Globe Hall, 20200 Observation Dr., Germantown. This event is sponsored by PeaceAction Montgomery, Montgomery College Peace and Justice Studies Community, Pax Christi Montgomery, Progressive Maryland, Montgomery County Government Employees Organization, DC Region Veterans for Peace, Social Justice Committee of UUCR, Progressive Neighbors of Montgomery County, Network of Spiritual progressives of MD, RRUUC Peace Action Task Force, Episcopal Peace Fellowship (MD/DC), and Maryland United for Peace and Justice. 1. Rising productivity since the mid-1990s has not lead to significant gains in real wages. 2. Income inequality persists as only earners in the 90th percentile have seen any wage increases. 3. 251,000 fewer Marylanders have health insurance than in 2001. 4. The unionized percentage of the state's workforce continues to fall. All week long, we have seen the Bush administration increase the size of its bailout to Wall Street. What about the rest of us? Rockville Central Radio interviewed me on Friday about Ike Leggett and slots, the state's transportation cuts and our recent series on the Gazette. If you can stand hearing any more from me than you already do, start at the 18 minute mark on the show stored here. Yesterday, Maryland Politics Watch surpassed 100,000 visits. To our knowledge, only seven other Maryland blogs - Red Maryland, Inside Charm City, Pillage Idiot, Rethink College Park, Howard County, Baltimore Reporter and Teach the Facts Vigilance - have broken that threshold. We know that some of you like our material, some of you hate our material and some of you change your opinion on a daily basis. But no matter how you feel about our content, we thank you for reading. Not content with his current position as the Vice-Chairman of the Montgomery County Democratic Central Committee, Alan Banov has mounted an insurgent campaign for the U.S. Presidency. Exclusive coverage of this breaking news story can be found here.
. . . according to a new poll from the DCCC. And so it has finally come to pass: County Executive Ike Leggett has announced his intention to vote in favor of the slots referendum. This may not have a huge impact on the referendum’s chances, but it could very well have a significant impact on the future of the County Executive. Why did Mr. Leggett switch his position to support slots? There are three reasons: the budget, the budget and the budget. Regular readers know that we have been following both the state and county budgets and the situation is grim. Montgomery County closed a $297 million gap this year and faces another $250 million gap next year. The state’s deficit could be as high as one billion dollars. While the slots referendum, if passed, would not generate any money next year, its importance looms in the out years. Back in April, we reported that state budget analysts estimated structural deficits of at least $600 million per year, every year, from fiscal 2012 on if slots did not pass. Now while the County Executive does not manage the state’s budget, state aid is an important component of every county’s budget. Next spring, the General Assembly will be considering cuts in aid to the counties. Mr. Leggett is calculating that if the slots referendum fails and Montgomery County is blamed, it will be targeted by the Lords of Annapolis (and especially by rabid slots supporter Mike Miller) for a disproportionate share of cuts. For example, if the legislature passes down teacher pension funding obligations to the counties, that will combine with Montgomery’s existing problems to create a county deficit of close to 10% of its budget. It is impossible to overstate the devastating impact such a deficit would have on county services. Mr. Leggett is seeking to escape that fate along with the resulting political consequences. Now Mr. Leggett may have little influence over the voters’ decision on slots. The introduction of slot machines to Maryland is not a complicated issue and voters do not need anyone to explain it. Many view slots as morally wrong. Many others view slots as preferable to tax increases. Will endorsements from politicians, one way or the other, really affect their thinking? Probably not. As we reported earlier this week, the Washington suburbs are currently the only part of the state in which poll respondents lean against slots. This creates some political risk for Mr. Leggett. But that may underestimate his potential problems. Among Democratic Party political activists – the people who contribute time and money to campaigns, and work hard to elect candidates – slots are HUGELY unpopular. Mr. Leggett will no doubt be paying close attention to the slots recommendation of Democratic precinct captains next week, which will likely determine MCDCC’s sample ballot recommendation. Smart money is betting on fierce opposition to slots from the county’s liberal grassroots. And what will those people think now about their pro-slots County Executive? Regardless of whether you agree with Mr. Leggett, he deserves credit for his honesty on the issue. Back in May, we revealed just how few politicians were campaigning against slots, even among those who voted against the referendum during the special session. Many of them privately hope that the referendum will pass so that they do not have to face a budget apocalypse so close to the next election year (2010). Mr. Leggett could easily have hidden under his desk with the rest of these politicians, but he chose to take a stand. Some time ago, I asked a prominent office holder who was a longtime slots opponent about voting on the referendum. After much hemming and hawing, this individual finally sighed, “I am voting for slots, but don’t tell anybody I said that.” Many, many politicians in Montgomery County – perhaps even a majority of them – hold this secret opinion. At least Mr. Leggett’s opinion is now out in the open. Update: Eric Luedtke's reaction is just a taste of what Mr. Leggett has coming. Rep. Wayne Gilchrest, a maverick Republican from Maryland, endorsed Illinois Democratic Sen. Barack Obama for president in an interview Wednesday with WYPR, Baltimore's National Public Radio station. Gilchrest, who lost a primary campaign and is retiring from Congress, has already endorsed the Democrat running for his seat, Frank Kratovil. Justifying his endorsement of Obama, Gilchrest said that "we can't use four more years of the same kind of policy that's somewhat haphazard, which leads to recklessness." Obama and his running mate, Sen. Joe Biden (D-Del. ), "have the breadth of experience. I think they're prudent. They're knowledgable." Gilchrest's reference to prudence may be an allusion to a widely-circulated op-ed written by conservative David Brooks, who questioned whether Alaska Gov. Sarah Palin had the necessary wisdom and prudence. Thanks to Marc Korman for the link. Problem with Daily Kos Tracking Poll? If you're among the poll obsessed like me and click for the latest polls several times a day at Pollster.com and Real Clear Politics, you may have noticed that the Daily Kos tracking poll appears the most favorable to Obama. Today, the tracking poll, conducted by Research 2000, has Obama leading McCain 49-43, or by 6 points. In contrast Gallup Tracking has Obama up by four points, as does Diageo/the Hotline (.pdf file). The Rasmussan tracking poll has the race as a tie. One tracking poll even has McCain up by 2 points, though I can't tell if this is just for the Battleground states or not. One might be quick to say that the difference between the Kos/R2K poll and the others is within the margin of error--and you'd be right. On the other hand, the Kos/R2K poll has consistently favored Obama over the past few days. Kos laudably releases the internals of the poll which show the demographic composition of the poll. I was surprised to see that Latinos comprise 13 percent of the sample. Now, Latinos compose around 13 percent of the population, so you might say that makes sense. However, many Latinos are non-citizens. The share of non-citizens is especially high among the voting-age population. A much higher share of Latinos not of voting age are citizens because they were born in the U.S., and thus are citizens by right under our Constitution even if their parents are not. Latinos skew around 2-1 for Obama, so including too high a share of Latinos might skew the survey in favor of Obama and against McCain. I don't know what share Latinos compose in many other polls--it's 8% in the tracking poll which favors McCain. I'd be curious to hear from people with more thoughts or information on this point. Update: Two top experts in Latino politics have told me that Latinos will probably compose around 8 percent of the electorate, confirming my sense that the share of Latinos in the Daily Kos poll is too high. The Sarah Palin VP pick, Hillary Clinton and the 2008 Presidential Race. Red Maryland blogger G.A. Harrison claimed last week that Maryland has lost over 2,500 jobs under Governor O’Malley. But that statement is a gross distortion with little basis in fact. Harrison cites Republican consultant Ted Pibil, who estimates that 2,533 employees have been laid off since the Governor took office. But this ignores the fundamental churning in the labor market: workers are constantly laid off in good times and in bad. The key statistic is net job creation, which is the total number of new jobs minus the number of terminations. According to the Bureau of Labor Statistics – commonly recognized as a more trustworthy source of economic data than GOP consultants – seasonally adjusted employment in Maryland has grown from 2,604,800 in January 2007 to a preliminary total of 2,637,600 in July 2008. In other words, net employment has risen by 32,800 during Governor O’Malley’s time in office. Now we do not deny that the economy is in rough shape. Foreclosures are up, state budget deficits are stubborn and gas prices are high. Those factors could yet drive down the state's job performance. But there is a fundamental truth that all politicians admit privately and none will say publicly: politicians often get too much credit when the economy does well and too much blame when it does badly. That applies to Bill Clinton, George W. Bush, Bob Ehrlich, Martin O’Malley and everyone else. The real test of a politician’s mettle is whether their policies tend to promote or discourage job creation and income growth. That is a worthy subject of debate on which people can disagree in good faith. Griffiths has a point. And Harrison can follow his recommendation by seeking statistics from bona fide statistical agencies rather than Republican consultants. By Montgomery County Democratic Central Committee (MCDCC) member Marc Korman. A recent Maryland Moment post announced that the Prince George’s County Democratic Central Committee has taken no position on the slots (sorry, video lottery terminals) question on the ballot in November. As MPW’s resident Montgomery County Democratic Central Committee (MCDCC) member, I thought I would share how the recommendation process works in our county. Why does it matter? Because the recommendation of the Central Committee is what gets printed on the Party’s sample ballot, which is mailed to the approximately 250,000 registered Democrats in Montgomery County. Back in April, I posted information about how to apply for the MCDCC Ballot Advisory Committee. MCDCC appointed the Committee members in May, appointing all fourteen applicants (one of whom later withdrew). 1. Elliot Chabot-District 19 MCDCC member and chair of the Ballot Advisory Committee. 2. Stan Boyd-District 20 precinct official. 3. Doug Canter-President of the D16 Democratic Club and precinct official. 4. Lora Drezner-District 15 precinct official. 5. Elihu Eli El-District 20 precinct official. 6. Dolly Kildee-Distirct 17 precinct official. 7. Eric Luedtke-District 14 precinct official. 8. Judy Stout-District 39 precinct official. 9. David Kipping-District 19 precinct official. 10. Rosalind Kipping-District 19 precinct official. 11. Esther Gelman-Former County Council and Planning Board member. 12. David Scull-Former County Council and General Assembly member. 13. Veronica Sheets-District 20 resident. 14. Luis Zapata-Organizer for several campaigns. The Committee met over the summer, deliberating and exchanging thoughts on the ballot questions both at those meetings and through other means. On September 2nd, they held a three and a half hour public hearing, allowing members of the community to share their views on the important issues at stake. I attended the hearing, which featured testimony from elected officials, community leaders, and others, primarily on the transgender referendum (since removed from the ballot by court order) and slots. The Ballot Advisory Committee recommendations are forwarded to the Montgomery County Democratic Precinct organization, which consists of a chair and vice chair for each of the approximately 250 electoral precincts in Montgomery County. Later in September, the precinct officials will take a position on each of the ballot questions by vote. Following the precinct officials’ meeting, MCDCC votes on each of the ballot questions. If MCDCC’s position on a question is the same as the precinct officials, that is the position of the party. If MCDCC disagrees, then the party takes no position by default, meaning they are neutral. I have been told that since MCDCC adopted that policy a decade ago, they have never disagreed with the recommendations of the precinct officials. It matters because the Democratic sample ballot will have the party’s positions on it. That ballot is mailed to 250,000 registered Democrats in the County and is available outside the polls on Election Day. It will not determine how every Democrat votes, but it can be influential. New Senate Minority Leader Allan Kittleman (R-9) issued an amazing statement today decrying the Governor’s upcoming spending cuts. You have to read this to believe it. Governor O'Malley's proposal to now cut one-quarter billion dollars from a budget only three months old will wreak havoc to state employees and those who depend upon state services for their livelihood. Many liberals might agree with such a statement. The problem is that Allan Kittleman himself would disagree with it – at least, before he apparently became a liberal. I support a smaller government that lives within its means. I firmly oppose increasing property or income tax rates. I would make up budget shortfalls by reducing expenditures in areas that are not primary functions of government and by eliminating government waste. Kittleman said Maryland has “a spending problem, not a revenue problem,” noting that state revenues continue to increase "1 to 2 percent a year. The Senate minority whip believes the state should simply limit its spending to the receipts it collects. “If you can't afford your mortgage, don't build a garage,” he said. Republicans on Tuesday called for O'Malley to revisit local aid when dealing with the budget deficit. Senate Minority Whip Allan H. Kittleman, R-Carroll and Howard, said the deficit could be solved by slowing state spending increases. “We can frankly resolve this problem not by having tax increases and not by cutting any programs,” he said. Kittleman then joined a lawsuit to overturn the special session’s tax package that was subsequently thrown out. One of the principle objections by the plaintiffs to the special session, of course, was that it focused on tax increases and not on spending cuts. After all this, Kittleman is now worried that spending cuts will “wreak havoc to state employees and those who depend upon state services for their livelihood.” So is the Senate Minority Leader a liberal, a conservative or someone who cannot make up his mind? You decide! Here are a few interesting findings from the latest poll by Gonzales Research that have not been widely reported. 1. The Governor's rebound in approval rating from 37% in March to 45% in September is due almost entirely to Democrats. Their approval for him rose from 48% in March to 59% in September, an 11 point gain. Approval from independents went up by 7 points (39% to 46%), but that is within the poll's margin of error of 3.5 points. 2. The Governor's approval ratings vary substantially based on demographics. Men disapprove of his performance by 43%-41%, while women approve by 49%-27%. Whites approve of his performance by 43%-40% while African-Americans approve by 51%-20%. The results for men and whites fall within the margin of error, so the Governor's net approval rating - currently 45% approval against 35% disapproval - is entirely dependent on women and African-Americans. 3. While the poll finds that slots support went from 54%-38% in favor in January to 49%-43% in favor in September, almost every region of the state still leans towards slots. The Washington suburbs, defined as Montgomery and Prince George's Counties, are the sole exception with 42% supporting slots vs. 50% against. That could make the sample ballots released by the the two counties' Democratic Central Committees crucially important to the upcoming slots referendum. The Prince George's Central Committee voted to remain neutral. The Montgomery Central Committee will vote on a slots recommendation on September 24. Tomorrow, MPW guest blogger and Montgomery Central Committee member Marc Korman will detail exactly how their recommendation voting process works. The County Council’s Transportation & Environment Committee, comprised of Chairwoman Nancy Floreen and Council Members George Leventhal and Roger Berliner, was informed about the state’s transportation cuts this morning. Their reaction was not pretty. Deputy Council Staff Director Glenn Orlin analyzed the cut list, which is included in the committee packet. There was broad agreement that the O’Malley administration had spread the pain around on the road projects. In general, the most recently added projects were the most likely to be cut. But the real sticking point was on the administration’s treatment of the state’s three major transit projects, which I chronicled this morning. All three Council Members zeroed in on the Governor’s ranking of Baltimore’s Red Line over the Montgomery-Prince George’s Purple Line and Montgomery’s Corridor Cities Transitway (CCT). That prioritization can be easily seen by the fact that the Red Line’s programmed funding (now $221 million) is greater than the combined funding for the Purple Line ($106 million) and the CCT ($48 million). But it goes further than that. The Ehrlich administration programmed Red Line funding of $80 million for right-of-way acquisition and $55 million for construction – decisions upheld by the current administration – while the two Montgomery projects are only funded for planning and engineering. According to the Director of Montgomery’s Department of Transportation (MCDOT), that sends a clear signal to the federal government: the state is more serious about funding the Red Line than the other two projects. And there is more. MCDOT reports that the Purple Line’s per-passenger cost varies from $14.30 (for the cheapest bus-rapid transit option) to $23.70 (for high-investment light rail). The CCT’s per-passenger cost varies from $18.25 to $32. The Red Line’s per-passenger cost varies from $18.10 to $62(!) The cost effectiveness threshold used as a rule of thumb by the U.S. Department of Transportation is $23.99, making many Red Line alignments ineligible for federal funding. Nevertheless, the O’Malley administration is advancing the Red Line over the other two projects. The evaporation of state funding is causing the Council to consider financing more state projects from county bonds backed by liquor profits, a practice that began in 2006. The movement of state projects in Montgomery County is so glacial that the county’s number one state construction request, a grade separation of the Georgia Avenue-Randolph Road interchange, is not scheduled for completion until fiscal year 2019. If that is the case for the county’s top-ranked project, how long do the trembling residents crossing the Intersection of Death have to wait for relief? The County Council and the County Executive will probably write to the Governor asking for him to explain the disparate treatment of the state’s three transit lines. And they will have to consider which state projects should be accelerated by county funding – a practice that, in a perfect world, they would never have to do. But all the county government can do is mitigate the damage of state cuts, an exercise it will probably have to repeat when the General Assembly reconvenes to discuss next year’s state operating budget. The real holders of leverage over the state are the members of Montgomery’s statehouse delegation. They are the largest geographic bloc in the legislature and it is time for them to work together to ensure that Montgomery’s transportation needs are not downgraded below other jurisdictions. As a transportation activist myself, I cannot describe how profoundly discouraging it is to be told that meaningful action on state projects is more than a decade away even on relatively small projects. How much longer must we wait? Update: The Examiner's Kathleen Miller has more. Buried in the details of the state’s recent $1.1 billion cut to transportation spending is a crucial fact: the O’Malley administration has decided that Baltimore’s Red Line is a higher priority than either of Montgomery County’s proposed new transit lines. Of course, this is not obvious from Secretary of Transportation John Porcari’s press release, which states, “The Baltimore Red Line and both the Purple Line and the Corridor Cities Transitway in the Washington region remain on track. Funding levels will allow each project to be ready to compete in the federal New Starts transit program next spring.” But the prioritization of the Red Line can be seen in the revised project list released by the Maryland Department of Transportation (MDOT). The numbers above clearly show that even before last week’s cuts, the Red Line was due to receive more money than the Purple Line and the CCT combined. And unlike the Montgomery projects, the Red Line was budgeted for both right-of-way acquisition and actual construction. The newly revised project list made the following cuts in total spending on the three transit lines. Negative numbers indicate increases. Under the state’s revised plan, the Red Line would actually get a spending increase of $8,928,000 through 2012. It would take a cut of $41.57 million in 2013 before getting an increase of $15 million in 2014. The Purple Line would get a spending increase of $763,000 in 2009-2010 before taking big cuts starting in 2011. The CCT would get an increase of $207,000 in 2009 before receiving cuts from 2010 on. The cut percentages for the three lines are 7% for the Red Line, 19% for the Purple Line and 47% for the CCT. These percentages as well as the distribution of funds from 2010 through 2013 point to an inescapable conclusion: the O’Malley administration has determined that the Red Line will come first, the Purple Line will come second and the CCT, with nearly half its funding eliminated, may never come at all. During the special session, the O’Malley administration promised the Montgomery County statehouse delegation $55 million for school construction – an amount that was subsequently cut to $46.3 million. Also at that time, the administration promised funding support for transit in Montgomery County. While the state transportation revenue shortfall made cuts necessary, the above data shows that those cuts are falling disproportionately on Montgomery's transit projects despite the administration’s assurances. Now, what will be the response from the Montgomery County delegation? The Chevy Chase Town Council met on Wednesday night. The executive session to discuss the acquisition of property began at 6:30 and the regular session began at 7:00pm. Public Comment: A group of B-CC students spoke during the public comments period to ask the Town to set aside space for a skate park. Variances: The Town Council unanimously approved two variances for the Thomas home at 3903 Thornapple St. and 4208 Rosemary St. Hearings and Council Actions: The Town Council held four public hearings on one resolution and three ordinances. No one testified regarding a resolution to confirm existing permit parking areas within the Town which was passed unanimously by the Council. Passage of a New Ordinance to Make It Easier to Replace Walls and Fences: The Council passed two ordinances to allow residents to replace existing fences and walls in their front yard and adjoining public right-of-way without having to go through the full variance process. Instead, residents will now be able to obtain an administrative variance from the town manager and mayor. Time Limits on Variances: No one testified at the hearing on the new ordinance to impose time limits on new variances. The ordinance requires residents to obtain a permit or request an extension of the variance within one year of receipt of a variance. The Town Manager and Mayor have broad discretion to provide extensions of both variances and permits. The new time limit will be written into variance decisions as well as the Town Code in order to make sure residents have proper notice. The new ordinance was approved on a 4-1 vote with Councilmembers Barnes, Enelow, Lublin, and Strom voting in favor and Councilmember Lang opposed. Contribution to Ellen's Run: The Council agreed unanimously to donate $1000 to Ellen’s Run. Town Elections: The Election Board—Costis Toregas, Bren Lizzio, and Hope Pinkerton—made a presentation about election processes in the Town. The Council complimented the Board on improvements to the process in the 2008 election, and approved their recommendation that the Town continue to employ the League of Women Voters to assist with Town elections. The Board explained that employment of the League made possible the substantial extension of voting hours and increased professionalism. Strategic Plan: Pat Burda and Bridget Hartman gave an update on the Strategic Plan, explaining that many of the Plan’s goals had been accomplished in a relatively short time. Town Manager Todd Hoffman has kept track of progress. Climate Protection: The Town Council scheduled a work session with the Climate Protection Committee on the Climate Protection Plan for November 6th at 7pm. Parks and Playgrounds: The Town Council accepted Councilmember Linna Barnes’s recommendation that the Town set up a Parks and Playgrounds Commission as part of its effort to promote play and playgrounds in the Town and obtain designation as “a playful Town”. The Town Manager reported that a memo of understanding had just been signed which will assure that the Leland Center playground is redone in the near future. The County is contributing funds in addition to the $30,000 donated by the Town. Public Safety: I reported to the Council on the meeting held by the Town Manager and myself with the Bethesda Police Commander on both communication issues and concerns regarding safety, especially in the parks and recent thefts from autos. I was pleased that the Town Council unanimously approved my request that we give the Town Manager greater discretion to direct off-duty County police officers employed by the Town to patrol by car and foot throughout the Town even as we maintain existing entry enforcement and the officer at CCES. The Bethesda Police Commander has accepted the Town’s invitation to speak at the Mid-Year meeting which will be held on November 13th. Traffic Safety on Bradley: The Council discussed the Traffic Engineer’s report on sight lines at intersections along Bradley Lane. The Council unanimously agreed to pursue efforts to improve sight lines where existing conditions are dangerous. Most improvements can be accomplished through trimming vegetation though there is also concern regarding a pillar at the intersection of East and Bradley. The Council also reiterated its support for measures to reduce speeding on Bradley La. and East-West Highway which will continue to be investigated by the Public Services Committee. The meeting adjourned at around 10:30pm. It's time for another MPW poll, this one on the state's biggest political feud. As you can see from their recent exchange of letters, there are many differences between Senate President Mike Miller and Comptroller Peter Franchot. But this poll focuses on their disagreement over the state budget. Simply put, Mike Miller defends the tax and spending package of the 2007 special session as necessary to close the state's structural budget deficit. He also believes that revenues from slots are necessary to fund education and other priorities in the future. Peter Franchot believes that the special session was unnecessary and its product has not worked. He also believes that slots revenues are not required to fund state programs. Let the readers decide who is right! Following is the text of Comptroller Peter Franchot's response to Senate President Mike Miller's letter of September 10. The Honorable Thomas V. Mike Miller, Jr. Thank you for your timely response to my letter of September 8, in which I offered a sobering overview of Maryland’s current economic conditions, assessed the severe toll they have taken on our state’s fiscal well-being, and called for the establishment of a bipartisan, blue-ribbon commission to undertake a comprehensive review of state government revenues and spending. While impressed by the length of your letter, and the obvious thought that went into it, I was quite disappointed by its tone and substance. It was yet another illustration of what is broken and dysfunctional about Annapolis. Instead of acknowledging that your solutions for Maryland’s immediate fiscal challenges – higher personal and business taxes, heavier debt loads and slot machines – are not working and far worse than the problem itself, you instead lobbed personal insults and questioned my character. A point by point written reply to your letter would, no doubt, be a waste of time, as we are both grappling with the critical issues facing Maryland, so I will spare us that chore. Suffice it to say that I respectfully disagree. In light of your correspondence, in which you questioned my motives, credibility, integrity, seriousness and effectiveness as a public servant, I’ll confess that I was tempted to respond in kind. I was tempted to compare my 22-year record of public service with yours as Senate President, one in which your formidable legislative prowess has often been overshadowed by intemperate public remarks, acrimonious personal feuds, unconditional fealty to the interests of the national gambling industry, and stories of brass-knuckle political tactics that would cause the hardest-bitten of Tammany Hall ward-heelers to blush. However, in the interest of restoring civility and purpose to the public debate, I won’t go there. I must, however, take issue with your attack on my agency and the 1,100 men and women who serve here with honor and distinction. Our agency is determined to help overcome Maryland’s fiscal challenges by tightening its belt and ensuring the prompt collection of existing tax revenues to which our State is entitled. Earlier this week, we presented Budget Secretary Foster with a series of operational efficiencies that, when implemented by the Comptroller’s Office, will save the taxpayers of this State over one million dollars. Thanks to the support of the General Assembly, we are moving aggressively toward the implementation of our Maryland Tax Fairness Initiative – a new state-of-the-art tax collection and compliance system that will ultimately generate between $80 and $100 million annually for the State. For a modest up-front investment in equipment and software, our Federal Vendor Offset Program – the first of its kind in the nation – is collecting more than $500,000 in unsatisfied tax liabilities each week. And we’ve brought in nearly one-half billion dollars in tax revenue owed the state through our aggressive actions against corporations sheltering their incomes with Delaware holding companies. We are achieving these ambitious goals within the agency budgets that have been authorized by the legislature. This extraordinary work was recognized earlier this year by the Association of Government Accountants, which presented my agency with the prestigious William R. Snodgrass leadership award, an honor that recognizes the outstanding leadership of individuals in state government that lead to improved financial management and consistently exhibit the highest personal and professional standards. You ended your letter by extending the invitation to speak with you directly about the work of the Comptroller’s Office. I appreciate the offer, and my staff will follow up with yours to arrange a meeting at our mutual convenience. Our State has arrived at an economic and fiscal precipice, and the time for letters is hereby over. To borrow your words, it is now time to earn the respect and gratitude of the citizens of Maryland by setting aside past differences, coming to the table, rolling up our sleeves and working through the challenges that threaten Maryland’s economy and quality of life.